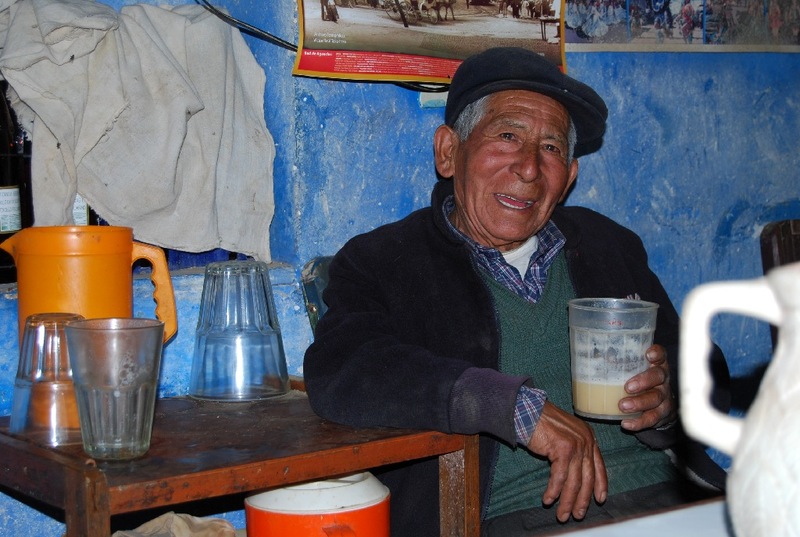 Chicha made from corn (chicha de jora) is the Andean drink that transcends time and space. It was present and formed a fundamental part of the diet in the Inca Empire just as it does in our nourishment today. 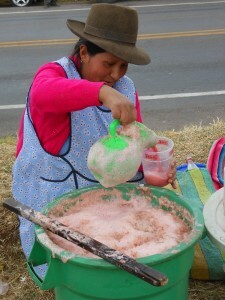 Cuzco has a variety of chicherías (places selling chicha) that draw in its people every day. 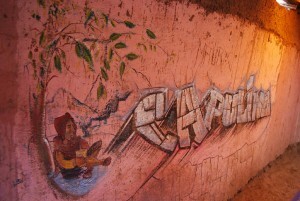 Ultimately chicha reached the coasts and jungles of South America. 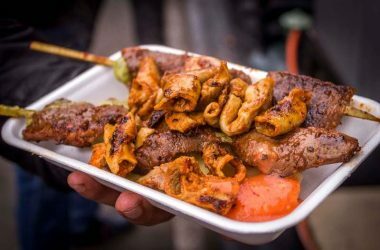 In this diversity of places it took on different contexts, new flavors, and a veriety of ingredients. In this way a rich variety of chichas was born from one side to the other of our continent. With the arrival of the Spanish and their missionizing of the population during the Spanish colonies many customs were banned. Among them was that of drinking chicha. At that time chicha became the forbidden fruit in Peru. With independence the repression of chicha weakened, even though critics persist. 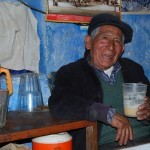 Since the Spanish arrived the people of the Andes have lost many customs, but chicha still accompanies them. It is a strong custom in the Peruvian population. In the twentieth century, with the development of Indigenism (a social and political current giving value to Peru’s native peoples and cultures as the base for modern Peru) chicha begins to take on new meanings. 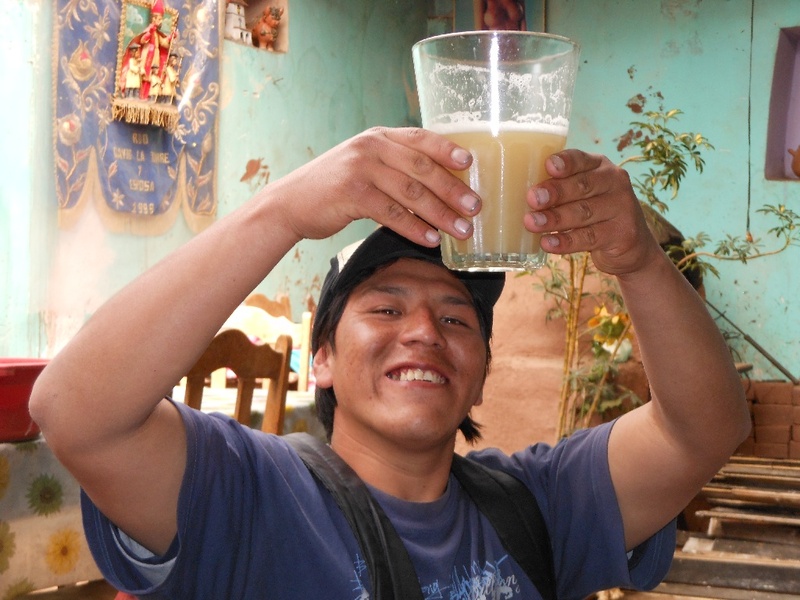 While chicha has had its detractors and its admirers, it has moved from being a mere drink to becoming a complete cultural movement that today is part of Peruvians. 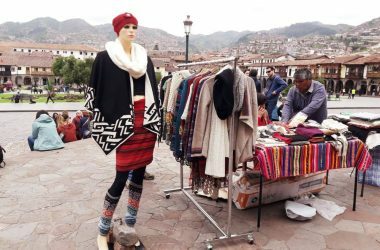 In today’s Cuzco there are many chicherías for the different tastes of its population. There are even chicherías in the center of the city. Over time, in Cuzco, chicherías took on the name of picanterías because where the drink was sold they also offered small dishes called picantes, or spicy food–a translation of the Quechua “uchucuta” which used to mean just food. . Even in our day one can find in the picanterías our traditional dishes that we call “typical”. Both before and today picanterías and chicherías draw a large part of the population. On the weekends one generally finds these places filled with people sharing tables and enjoying the food and drink. 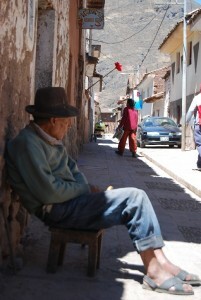 It is five in the afternoon and in the popular thought of Cuzco is is the “hour of the picante”, spicy food. Many hurry up their work. Others rush to leave it to arrive at the chichería that is closest to their house. The custom is still strong in our days. From the center of the city to its most distant corner one finds chicherías. They take different forms according to the place. Those in the historic center have an air of tourist restaurants, while those further from the center look different. They take on particularities according to the the zone where they are found. The vary in decoration. The different colors, smells, energy, warmth of the people, among other characteristics, all make them individual. Because of the great variety of chicherías that exist in the Imperial City and to sew in you the curiosity of visiting these different places I will write briefly of some of them. Beginning our visits in the center of the city, we find ourselves in Quera Street. In the depths of an old casona, or big house, with two patios, we find a welcoming place that is warm and has its fogón, its adobe stove lit. It has good service. To this place come many people from lunch time on since it also serves “extras”, special dishes. The tables of this place are typical of the picanterías of Cuzco. They are long rectangular tables where up to five people fit comfortably along one side of the table. Instead of chairs it has long benches without a backrest. This is another characteristic of the chicherías. In addition on the walls one finds a picture of some saint of the Catholic faith. To the side of the doorway, there is a plastic jar with a branch of rue in it. This plant starts the business going well and plainly shows Andean thought. Outside the door is a bar with a red plastic loosely wrapped around it. This is a sign that there is still chicha in the chichería. They show this red sign from the time they open until they close or until the chicha runs out, whichever happens first. They also offer other drinks such as frutillada, a chicha with strawberries in season, and a vriety of brands of beer. The majority of people who come to this place to meet each other carry out their daily routines nearby. It used to the that the chicherías of the center were like cafés where intellectuals, artists, and the bohemians of the time would gather, Now the chicherías are more cosmopolitan. The majority of the people go to just enjoy the extras. Continuing through the center I wish to tell of a place that was born little by little with time in an attempt to give a place to the new socil groups that have appeared in the socialcultural context of Cuzco, groups that many people see as lower and as a result are often discriminated against or pushed aside. Many times things are not exactly as they are imagined. That is why I present this place which receives those who own the voices behind the silence of repression. It is a place that has a spark of joy among thosw who share table. In their majority they are students of higher education or of some institute or young people whos have come from all over the country and survive thanks to selling some kind of handicraft which they may make themselves. A few foreigners who have lived in Cuzco for some time also come. With time they all have made this place theirs. It is hidden in the depths of a colonial mansion. At the base of this corner is found a Capulí tree to which the place owes its name. This small and inviting place welcomes all who arrive with joy. Many young people are there enjoying chicha or frutillada which, in general, comes out in pitchers. Around the tables you can discuss any theme with complete freedom. Laughter is a common characteristic as is the good energy you can feel. When you enter all greet you. 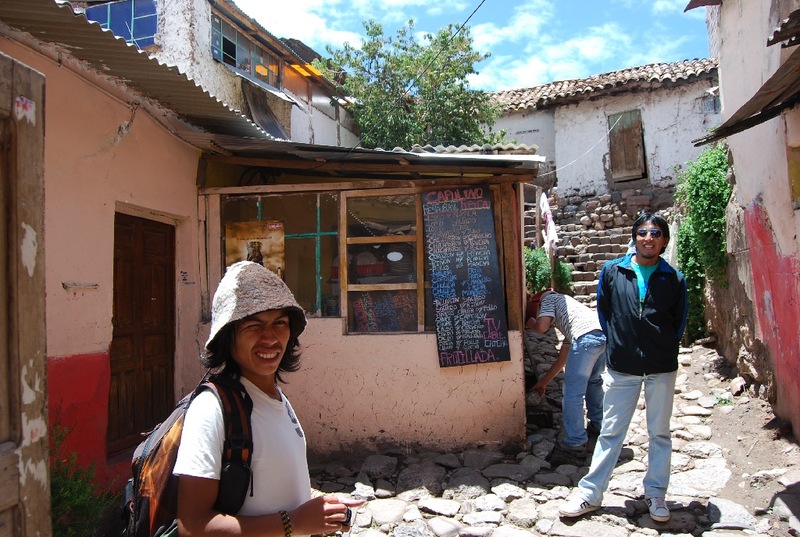 The music playing is very diverse, from local stations with popular Peruvian music to reggae, punk, rick, etc. There is also music that the students carry on their jump drives. It changes according to the preferences of whoever happens to be there in any given moment. From the outside this looks like a restaurant that serves traditional food. There is just a small room in back and on the last level where these people take asylum from the light of day while this place stays open. It is a small place with only three or four tables. The place is very precarious with an open ceiling and windows without glass. So do not expect a section for smokers and one for non-smokers. If some smoke they blow the smoke out the windows to not bother others. Tolerance is strong here. Some people even smoke marijuana even though it is not legal in the country. But it is a secret that they keep. To represent their identity, the walls of the room are covered with graffiti. The attention is personal. If you want something, you have to go down to where they serve the food and carry it to your table. That is why it is difficult for isolated groups to form at the tables. When you have to get your own food you do not have the option of choosing a table. So you sit wherever there is room. This place closes when afternoon moves to night. At that time the number of guests drops in this corner that receives many people who are made marginal because they think differently. Now leaving downtown we arrive at The Chichas of the San Blas Overlook. It is a welcoming place in the middle of the agitated San Blas neighborhood which receives visitors from all over the world. 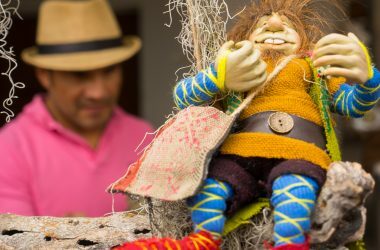 San Blas is also the cradle of artists, painters, musicians, artisans, and so on. The Chichas of the San Blas Overlook is found on Quisca Pata Street when you continue on up the rise towards the overlook in this popular neighborhood. At the end of the stairs one finds a small overlook with a wooden fence on the face of the house where the chichería is. You have to go to the back of the house by a small, narrow alley until you reach a tin door which welcomes us to the patio of the chichería. 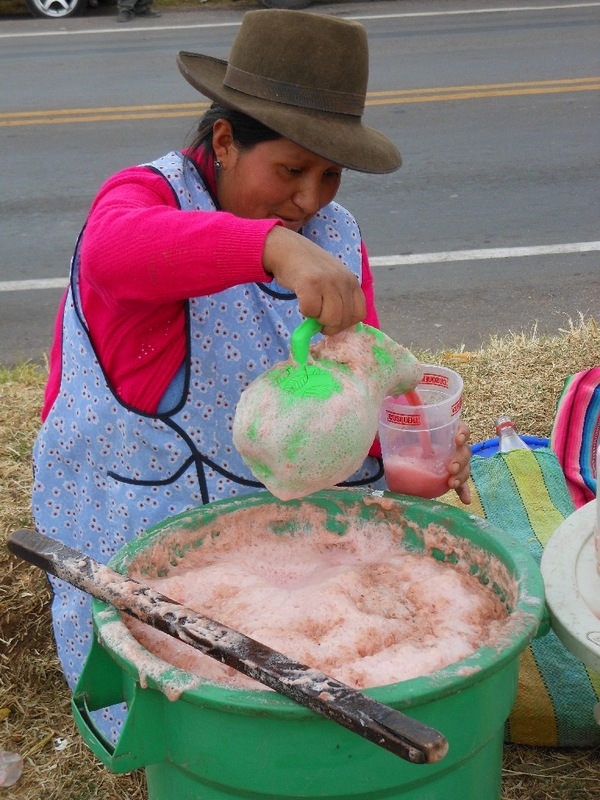 This chichería does not carry the red flag denoting the presence of chicha since it is very popular. We could say that it has a fixed clientele since the majority of the artisans of San Blas and its surroundings have the custom of drinking chicha there after there work day ends. 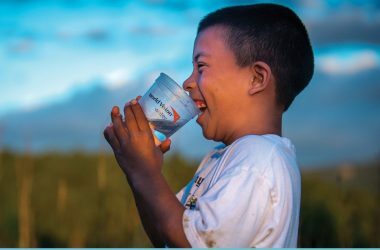 They have done it for generation and consider the drinking of chicha to have great importance so that their health will continue good sicne they work surrounded by dust. They need to clean their lungs, avoid prostate problems, or any respiratory problems. That is why they drink chicha. It is a place that is also cosmopolitan. In the patio where we first entered there are no tables, but just benches on which one can sit and enjoy the tranquility of the place. If one enters the kitchen, one can see a raqui, a recipient with a large capacity in which the chicha is made and from which it is served. 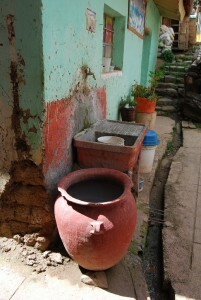 In this chichería you can still find the old style utensils with which chicha is made. There is also wood stove (fogón) as well as a space for guinea pigs, since they run freely around the kitchen floor. Lots of people come to this place from the neighborhood of San Blas and its environs. 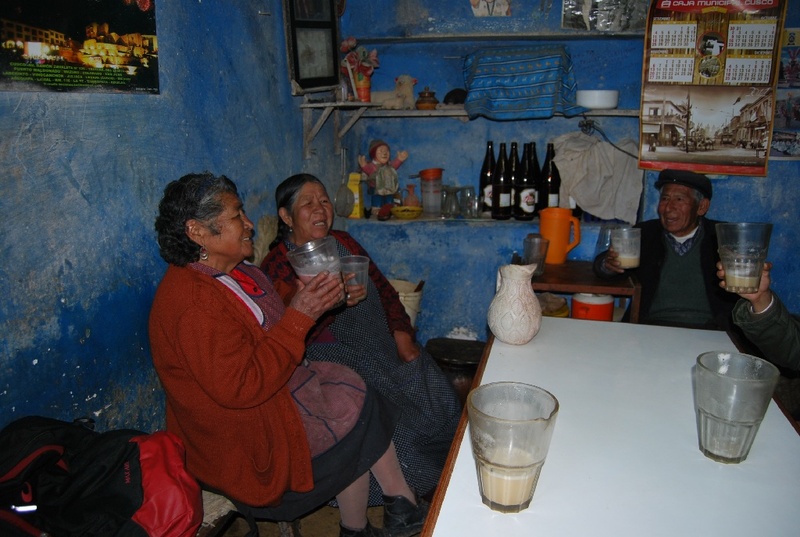 We can find women in traditional dress (mamachas) or even visitors from communities outside of the city, rural people who despite the passage of time continue meeting up in this place to enjoy some chichas, meet friends, and have a good conversation. Besides the patio there is also a room with tables and benches in the typical style of the chicherías. The music played is generally the traditional huaynos from a local radio although it can vary depending on who all is there. 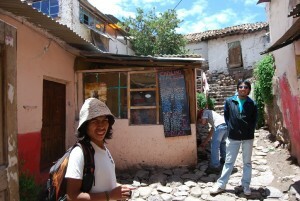 It is in this place, I think, where they make one of the best chichas in all of Cuzco. It has body and a very pleasant taste. It is not too sweet nor too bitter, not too thick nor too thin. It does not smell of alcohol and instead has the singular, fresh smell of foamy chicha. It is served straight from the raqui to the glass, which is called a caporal since it is a very large glass. This glass of chicha costs one sol. If it is served completely full it is called a double. If a simple is served then the glass is filled a bit more than half full and costs only half a sol (50 cents). The experience of drinking chicha is very different from drinking any other liquor. 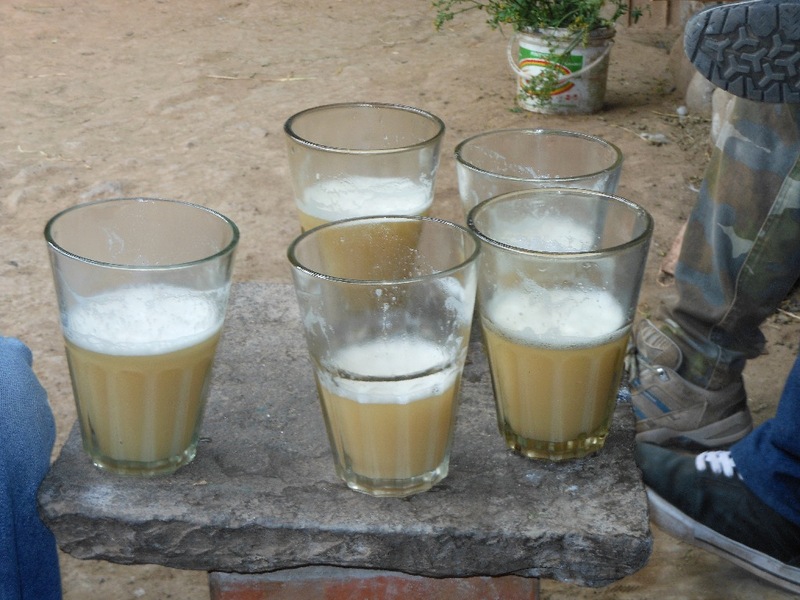 The percentage of alcohol in chicha is very different from that of other drinks. It is only 4 or 5 percent. So after drinking a couple of glasses you still feel fine. A couple more and you begin to feel an emptiness in your stomach which makes you not want any more. The you have to run to the bathroom to urinate since chicha is a diuretic. Once back you can continue drinking with no problem. The first drinks are refreshing. The next make you feel a lot of energy. Chicha is very fresh (cold in the hot and cold system). If one does not have the custom of drinking it sometimes it can be very uncomfortable to drink too much. Four glasses is enough. It is not necessary to continue drinking. Chicha continues to ferment in your stomach, they say. If you were to continue you would get very drunk. 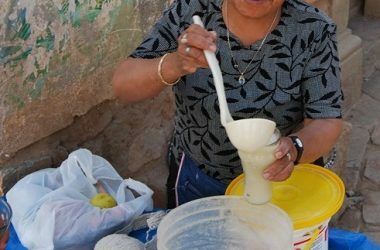 As a result many people have their chicha along with cañihua flour or a dark beer to balance out the chicha’s cold. Some people even prefer to have their chicha warmed. 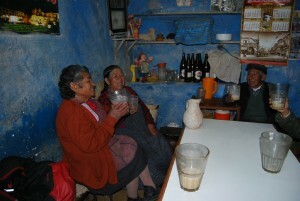 Drinking chichas is a living custom in Cuzco and the chicherías are places that perdure. They fight against development and modernity. Sometimes they even adopt aspects of these, such as television and other electronic apparatuses which are present in some chicherías. I am sure that if you visit these places you will be enchanted. They are like time capsuls of customs which we still live today.